I am an advocate for the responsible development of renewable energy. I've been working with wind energy, my specialty, since the mid-1970s. For more on me and my background, see my biography. I write and lecture on wind energy, Advanced Renewable Tariffs (the modern version of feed-in tariffs), energy policy, and electric vehicles. I am not an engineering or technical consultant. How Do I Earn a Living? Most of my earnings come from my writing and from my lectures. 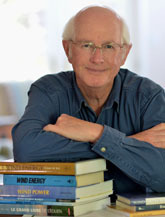 I receive royalties from my books and honorariums from my lectures on wind energy or feed-in tariffs. In 2004 and 2007, I worked in Toronto for the Ontario Sustainable Energy Association and the Toronto Renewable Energy Cooperative. In 2009, I again worked the first half of the year for the Green Energy Act Alliance. For a more complete account of my work experience, see my biography. From 2008 to 2012, I've received several small grants from non-profit foundations, including grants from the Jan & David Blittersdorf Foundation, An Environmental Trust, David Blittersdorf Family Foundation, and the World Future Council. In 2012 I began an extensive revision of my big book on wind. Because this undertaking required total focus, I ceased all work with non-profit foundations. I do a lot of pro bono work. Nearly all, if not all, my recent articles on small wind turbines and electric vehicles, for example, are pro bono. Why Do I Make This Information Public? Surprisingly, I get the question about how I earn my living more often than one might think. The news media often wants to know who is paying me so they can judge my credibility on certain subjects. Thus, I've decided to make this information public. I am also making this information available because there are a number of so-called public-interest organizations that keep their sources of funding secret. Revealing their sources of funding might call into question their role in public policy debates. This is particularly true in the debate around the role of feed-in tariffs in North American energy policy. Over the years I've provided services to many different groups and organizations. In the late 1990s, my critics in the US wind industry demanded that I disclose who I'd worked for so they could identify any conflicts of interest. It's for this reason that all my presentations begin with the following disclosure statement. Paul Gipe has worked with Aerovironment, ANZSES, An Environmental Trust, APROMA, ASES, AusWEA, AWEA, Blittersdorf Family Foundation, Jan & David Blittersdorf Foundation, BWEA, Bundesverband WindEnergie, CanWEA, Canadian Co-operative Assoc., Canadian Auto Workers, CEERT, Deutsche Bank, DGW, DSF, EECA, ES&T, the Folkecenter for Renewable Energy, GEO, GPI Atlantic, the Institute for Local Self-Reliance, IREQ, the Izaak Walton League, KWEA, MADE, Microsoft, ManSEA, the Minnesota Project, MSU, NRCan, NRG Systems, NASA, NREL, NZWEA, ORWWG, OSEA, the Pembina Institute, PG&E, SeaWest, SEI, the Sierra Club, TREC, UCS, USDOE, WAWWG, WE Energies, World Future Council, and Zond Systems, and written for magazines in the USA, Canada, France, Denmark, Germany, and New Zealand. The views expressed on this site are those of Paul Gipe and are not necessarily those of the foundations that have sponsored or are sponsoring my work or any of the organizations that have paid for my services. Please note that I am not an engineering consultant. I write and lecture on the subject of wind energy and increasingly on other sources of renewable energy as well. I provide advice to governmental, non-governmental, and advocacy organizations. If you are seeking an engineering consultant, some that I recommend are listed on this web site under Links. Wanting a Windmill for Your Backyard? Please read my books--that's why I write them. I do not provide free advice to those wanting a wind turbine in their backyard. If the answer to your question is not in my most recent book, I suggest posting your question to small-wind-home. There are several experts on small wind turbines who post regularly to this news group. I will assist graduate students, NGOs, and professionals as time permits. If you need parts, service, or advice on how to maintain your small wind turbine, you can subscribe to the yahoogroup small-wind-home. There are several knowledgeable participants on this list who offer a wealth of technical information. Once you've subscribed, monitor the list, then, when you're ready, post your question.